Cesc Fabregas after eight years of service has left Arsenal football club. Farewell to our club captain and best player (in my opinion anyway). The last month or two may have turned a bit ugly with people having their own opinions on how Cesc, Arsenal and certainly Barcelona have acted but as time passes, I get the feeling people will remember what Cesc brought this club. Feel free to dislike Barcelona as much as you want though! I do not accept it when people say Cesc did not give 100% when playing for Arsenal. His last season was not his best by any means but after the world cup and the injuries he carried, it was difficult for him. 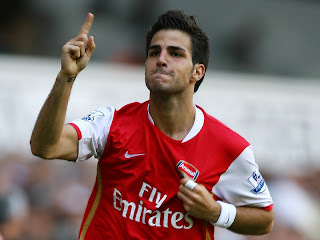 Cesc played over 300 games or so for this club and his vision, his ability to pick a final ball was something special. I remember his goal in Milan or the goal vs Spurs, they were my personal favourites but there were others. Best of luck for the future Cesc; I would wish Barcelona well but after the way they have behaved, I rather not but I genuinely do wish you Luck. You were a world class player. Maybe one day we will see you back.